You recently commented on my blog and thought I'd jump over to check yours out....and I'm so glad I did! What a beautiful site. All of your details - everything from your colors, your banner to the title (I love the song 'Sidewalks of NY") are just impeccable. I look forward to following your adventures in my hometown! I love the armory. The old fashion house I worked for in the city had their fashion week show their every season. : ) Great memories! Oooh thanks for the visit and I LOVE that you made the connection! Can I confess now that this was my first visit to the armory? I want to hang my head in shame. 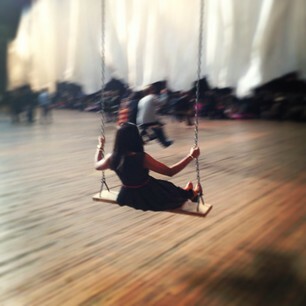 It is a remarkable space and I am envious of how fun (and insane) it must have been for you every fashion week. Now that Ann Hamilton is over, I wait to see what's going to be in that space next..
ps - I think your blog is hilarious and look forward to each and every one of your posts! This is lovely. One question, though: could you please explain what "sim" means? I'm not sure I've seen this word in English before. Thanks for dropping by! LOL I realise I probably use a lot of words that may not seem to be English! Anyway "sim" is shorthand for "similar" - I use it when I can't find the link to the exact item I am wearing so I show you alternatives for a similar look. oh amazing- I'd heard of the installation but I love seeing your perspective on it. I would have loved to experience it! It's too bad these kinds of projects are so temporal though- I always miss out!